Virtual Paintout - Lancaster County! End of the month so it's time to post my Virtual Paintout pieces. 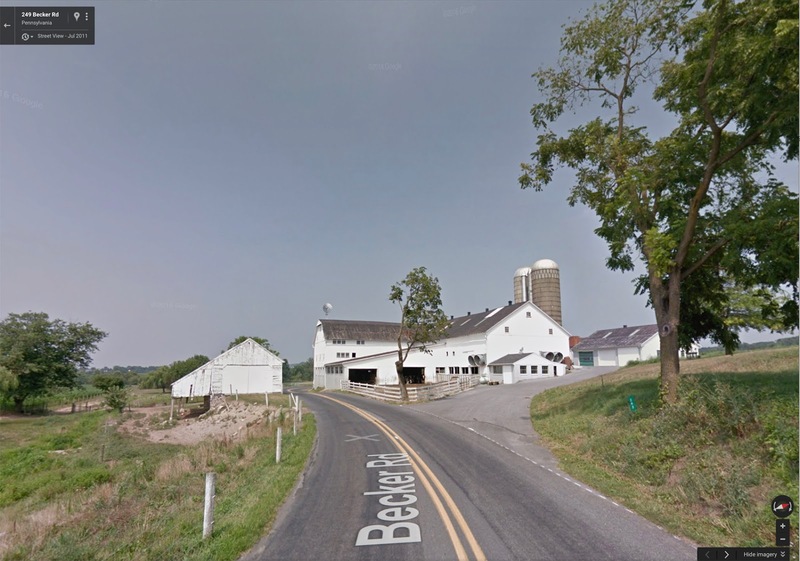 For September 2016 Bill Guffey, chose Lancaster County, Pennsylvania for our location to virtually find our views to paint. I was excited to virtually visit there and I wasn't disappointed. 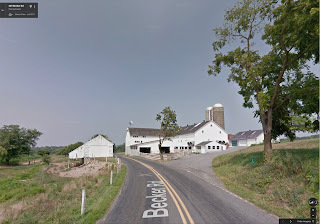 So many wonderful farms and beautiful barns to choose from. Fun for me to see since here in Southern California we just don't have such scenery. 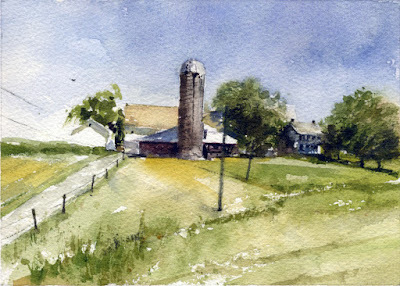 I didn't even begin browsing the cities and tried two rural watercolors. I was really looking forward to the Saturday paint-out at Liz's house. Liz is an artist in many media and I know from her Pasadena Adjacent blog that she has eclectic tastes and likes funky flea market finds...just my style as well. I knew she would have a great garden and I wasn't disappointed. From Liz's patio there is also a nice view to the next hillside. What to paint! I thought about titling this post "Goldfinches!" because of Liz's feeder and the many visitors she had. Such fun to watch while painting. I tried a small gouache piece and had to leave out so much of my view. I only had room for one birdhouse instead of two, only one decorative blue bottle instead of many. I did add three little goldfinches. Thanks Liz! 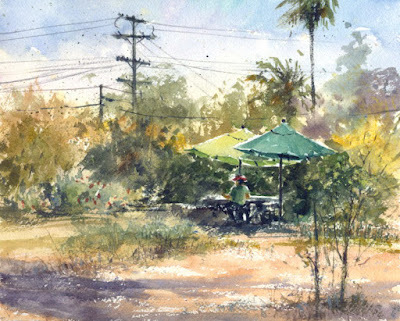 We had a beautiful day for plein air painting in Sierra Madre last week. One of our artists works at a salon that's located in a charming bungalow. He got permission for us to paint there and I was happy with the many views for a possible painting. 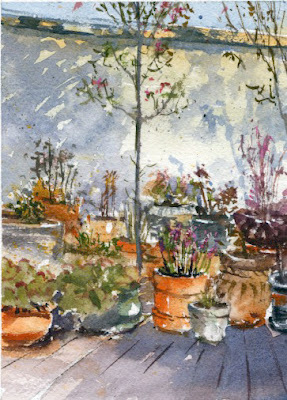 I ended up doing a small watercolor of the colorful potted plants on the north patio. The shadows on the building next door also caught my eye. 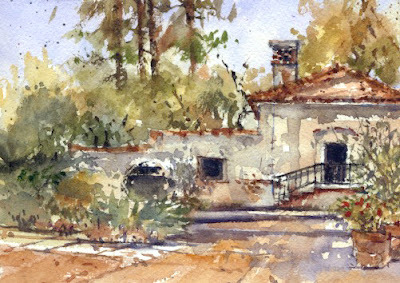 We returned to Mater Dolorosa Monastery in Sierra Madre last week for the paint-out. 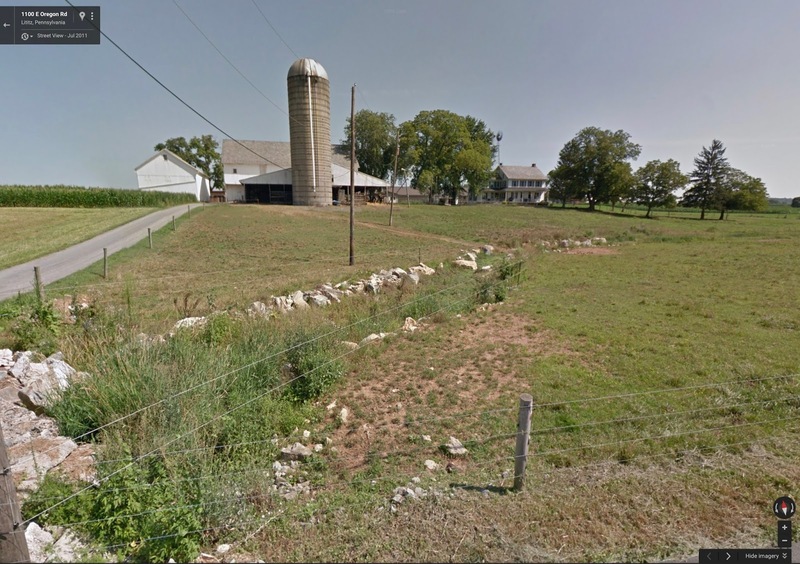 It's been a retreat location since 1926. 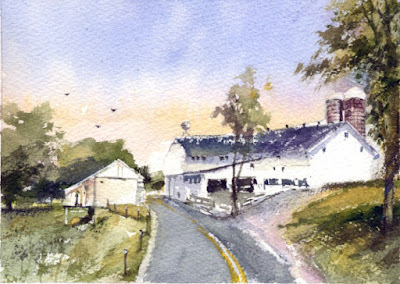 It's wonderful that they don't mind visiting plein air artists. This was my third visit. 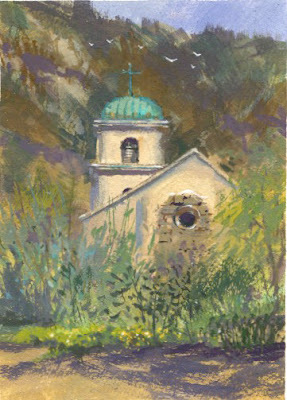 I painted a watercolor Painting at the Monastery last time. The herd of deer that we saw then was there again and didn't mind photos. Neat to see them. I've probably been avoiding painting the main building so I gave it a try in gouache. I sat down a slope from the main building and just had view of it peeking through the trees above me. It's always a peaceful setting for painting, a quiet retreat. 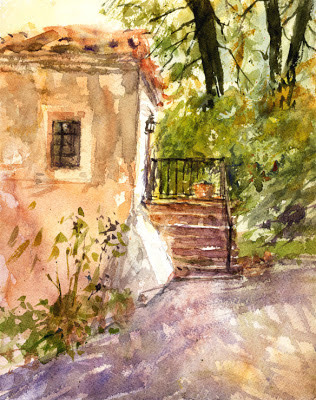 The Old Mill in San Marino is such a wonderful setting. The historic adobe building from 1816 is surrounded by lovely gardens and fruit trees. The last time I painted there was in January, Old Mill in January. Since it's summer, there was a possibility of very hot weather but the day was perfect. In 2012 when I had just started plein air painting it was over 100 degrees for our Saturday paint-out at the Old Mill. Special events are another possibility there, especially on a Saturday. Sure enough, at one point a woman told us that people would be setting up for a wedding in about half an hour. We were painting where the wedding activity would be. I painted a little more quickly and finished up as arriving planners and flowers started blocking my view. 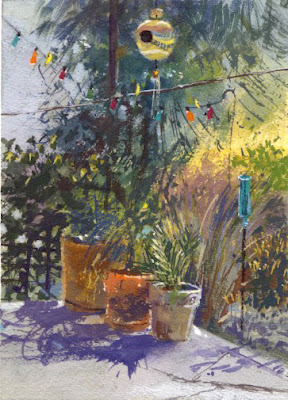 Plein air painting can be exciting!